Payouts from the firearms maker have likely peaked for the foreseeable future. Now that Smith & Wesson is off venturing into the great, rugged outdoors, Sturm, Ruger (NYSE:RGR) is the only publicly traded, pure-play gunmaker left on the market, and its fortunes will rise and fall on firearm demand. Its stock, however, will continue to move on the whims of where the industry is heading, and that's probably down for the foreseeable future. 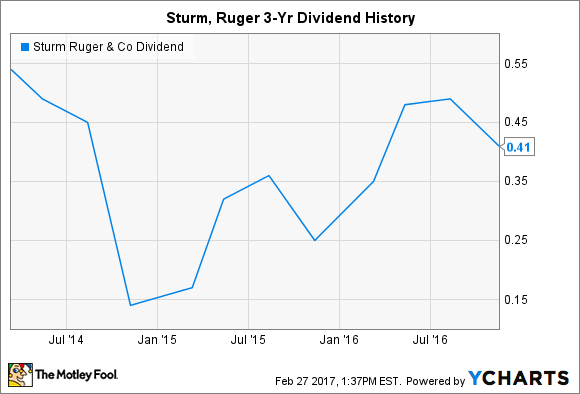 Unfortunately, it also means Ruger's dividend is likely at its peak for the time being as well. The gunmaker reported fourth-quarter results that saw sales rise 6% to $161.8 million, while earnings jumped 25% to $1.10 per share as its sales once again outpaced the record rise in background checks on gun buyers performed by the FBI. The gunslinger said the sell-through of its products from independent distributors to retailers rose 12% last year, while adjusted National Instant Criminal Background Check System (NICS) volume increased 10%. The FBI conducted a record 27.5 million checks in 2016. Ruger also declared a dividend of $0.44 per share, up 26% from the $0.35 per share it paid in the year-ago period. However, Ruger's stock is down nearly 30% over the last 12 months and traded even lower after reporting earnings in late February. Investors are concerned with gun-buying demand trailing off -- December NICS checks were down 16% year-over-year and January declined 20% as well. Considering the number of background checks conducted in Feb. 2016 were the third highest for any month since the FBI started recording the data, we're likely to see an even bigger drop when it publishes the latest numbers. And that doesn't bode well for Ruger, American Outdoor Brands, or Vista Outdoor. Despite the surging demand seen during President Obama's administration, stocks are a forward-looking vehicle, and bearish sentiment is taking over. It's particularly problematic for Ruger's payout, which is tied to how much profit it makes in any particular period. Unlike most companies that pay dividends of a set amount, Ruger established its payout in 2012 at a rate of approximately 40% of net income. That means its dividend payments are going to vary. While Ruger's dividend isn't especially unique, with other companies such as Cal-Maine Foods and CME Group having similar policies in place (albeit at different rates), it does mean that a weakening outlook for the firearms industry will result in lower payouts in the future. Right now, there are no major catalysts on the horizon that are likely to alter the trajectory of the industry. A presumably gun-friendly Republican president and Congress will prevent any serious anti-gun legislation from advancing. Without the looming threat of gun control measures, it appears many customers are holding off on new purchases for the time being. American Outdoor Brands may have sought to minimize the volatility of its business by rebranding itself as an outdoors company and expanding into new markets, but Vista Outdoor's recent 20% plunge showed that reporting a slowing ammo business will cause investors to bail. American Outdoor may not be able to fence off its still very strong ties to the gun market as quickly as it hopes. That leaves Sturm, Ruger, which is also the biggest gun manufacturer in the market, ultimately feeling those effects even more acutely. It doesn't mean the gunmaker will be suspending its dividend, but income investors shouldn't count on seeing significant payout growth anytime soon.